The British excel at political theater, but the carefully staged publication of the long-awaited Saville report on Bloody Sunday produced an effect no government choreographer could possibly have predicted. 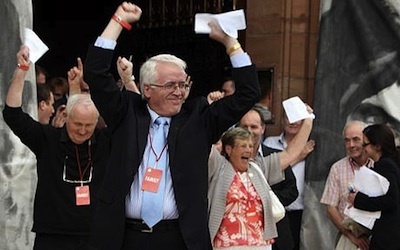 A large crowd, several hundred strong, of Northern Ireland’s nationalists had gathered by a TV screen in front of Derry’s Victorian Guildhall awaiting--anxiously, fearfully--an announcement to accompany the publication by the new Tory prime minister, David Cameron. Four words caused the crowd to raise a prolonged cheer: “I am deeply sorry,” Cameron told the House of Commons. Cameron, an old Etonian of the toff class so despised by working-class Irish Catholics, then declared the unequivocal results of Lord Saville’s investigation, the longest and costliest public inquiry in British history--twelve years in the making, at a cost to the taxpayers of $300 million. Saville’s report had found the shootings in the Bogside “unjustified and unjustifiable,” in the words of Cameron. Those shot were not IRA gunmen or bombers, as the army had long claimed. They were civilians, stone-throwers at worst. More cheers at the Guildhall. More clenched fists punching the summer air. But as the cheers died down and people started to read the ten-volume, 5,000-page Saville report, they discovered that Saville had cleared the top army brass, finding fault only with the paratroopers’ battalion commander, Lt. Col. Derek Wilford. He is the Lieutenant Calley of Bloody Sunday. Wilford was blamed for exceeding his orders and allowing his trigger-happy troops to chase fleeing marchers into the heart of the Bogside. Saville had no reprimand for the generals who planned the operation, nor for the politicians in Belfast and London--the prime minister at the time was another Tory, Edward Heath. Whether the families or government prosecutors will seek criminal trials of the paratroopers for unlawful killing, or for perjury for lying about their actions, is not yet clear. But whatever the outcome, the Saville report has underscored the difficulty of “truth and reconciliation” inquiries, a la South Africa, in countries where there has been no revolution and where the government remains essentially the same, just of a different stripe. In Tiananmen Square, Grozny, Darfur, Falluja and Gaza, the real truth will always be hard to come by, was Saville’s message. In the end, it is noteworthy that Saville relied heavily on statements taken by reporters in the first week after the shootings. Those were the interviews that often proved to be the most accurate and durable over the years, the report acknowledges. Reporters’ notebooks, including mine as a member then of the Sunday Times’s Insight team, took on surprising value. When witnesses forgot, or did not own up to what they had said earlier for fear it would land them in trouble, Saville relied, time and again, on the first cut of history. Saville’s report is now accepted with relief by the families as the official truth--but only regarding who shot whom. The darker side of Bloody Sunday--and of the forty years of the Troubles in Northern Ireland, during which more than 3,500 civilians and soldiers died--was the role of Britain’s secret service, MI5. Here Saville failed. The example attracting most publicity is an allegation by MI5 officers that Martin McGuinness, then second in command of the Derry Provisional IRA and now Northern Ireland’s deputy first minister, told an MI5 undercover agent that he had probably initiated the paratroopers’ lethal response by firing a submachine gun in the Bogside. McGuinness vigorously denied the charge. MI5 refused to produce its agent for examination, on the grounds that exposure would endanger his life. Saville was forced to conclude that it would be “unwise (and, indeed, unfair) to place much weight” on this hearsay evidence. And he didn’t. But the truth remains locked up. The suspicion will linger with those who choose to give credence to the story--and that, of course, was the intention. In dumping all the blame on Colonel Wilford and clearing army commander Maj. Gen. Robert Ford, Saville concluded that Ford “neither knew nor should have known at any stage that his decision would or was likely to result in soldiers firing unjustifiably.” But paratroopers, famous for going into battle “hard and ready,” are not obvious units of choice for urban security or civil rights marches. In the run-up to Bloody Sunday, Ford had favored an escalation in the army’s response. The IRA was operating a “no go” area in the Bogside, and Ford was determined to restore law and order. He told a senior commander he was coming to the conclusion that the level of force required was, after clear warnings, “to shoot selected ringleaders” among Derry’s stone-throwing youths. Ford chose the paratroopers, who were armed with standard NATO rifles. As they entered the Bogside that January day, Ford was on the street to urge them on: “Go on 1 Para, go and get them.” The risk to innocent bystanders of using such troops, prepped to shoot, and such weapons, designed for maximum killing power, was clear. And the architects of this plan bear no responsibility?